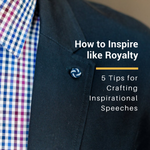 This month we take a look at what it means to be inspirational, and how to communicate with impact. At the office or making a toast at the dinner table, these tips will help you speak with effective passion. This past Saturday, November 11th, the United States celebrated Veterans Day to honor our military veterans. This time of year reminds us of the closing remarks recently made at this year’s Invictus Games. Founded by Prince Harry in 2014, this international multi-sport event hosts wounded or sick armed services personnel. In his closing remarks, Prince Harry makes use of a few key strategies that transform his words into an inspirational message. Follow these 5 tips to make your toast a legendary memory.